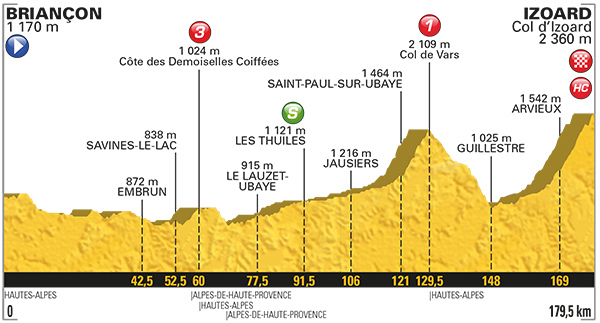 Weather at Arvieux, 10 km from the finish: 23C (73F), partly cloudy with the wind from the SW at 14 km/hr (9 mph). No rain is forecast. Km 40: The 54 riders are 4min 36sec ahead of the peloton, which still has the yellow, green, white and polka-dot jerseys. Three teams don't have riders in the break: Sky, Bora-hansgrohe and LottoNL-Jumbo. None of the escaping riders are a threat. The best-placed of them is Brice Feillu, 16th at 33min 32sec. Km 46: Sky leads the pack, which is quite strung out. Km 60: It was inevitable that such a large breakaway group would fracture and on the third-category Côte des Demoiselles Coiffées it happened. Nicolas Edet, Thomas de Gendt and Lilian Calmejane went clear and crested with a 15-second lead. The peloton is 5min 37sec behind the lead trio. And the trio is quickly retrieved on the descent. As Sky leads the pack up the hill, Rigoberto Uran's Cannondale-Drapac team sits right behind them. Km 82: Seven riders went clear from the big break: Clarke, Brambilla, Vachon, Swift, Chavanel, Tulik and Pauwels. They are 38 seconds ahead of the now 47-man break and 7 minutes ahead of the pack. Km 90: The seven escapees were caught and we're back to a 54-man break. The gap back to the peloton has grown to eight minutes. Km 100: Sonny Colbrelli won the intermediate sprint. The 54 lead riders still remain together, 8min 26sec ahead of the peloton. Km 119: Approaching the Col de Vars, the break has split in half with 22 riders 1min 5sec ahead of 32 chasers. The peloton is 7min 10sec behind the front break. Km 126: Sky leads the peloton on the beginning of the slopes of the Col de Vars with Rigoberto Uran's Cannondale-Drapac team right behind. Riders are starting to get dropped. Up front things have come together a bit, with 31 riders 7min ahead of the peloton. Km 149: Alexey Lutsenko was first over the Col de Vars. At this point, providing he finishes the race, Warren Barguil has won the 2017 Tour's King of the Mountains competition. As the riders pass through the town of Guillestre, there are eight riders in the lead. The there are 23 riders between the eight and the peloton, which is 5min 49sec behind the leaders. Ag2r leads the peloton. On to the Col d'Izoard! 21 km to go: There are three riders off the front: Lutsenko, Hardy and Edet. They have a 10-second gap on a chasing group of 7 riders. The peloton is getting closer, 4min 51sec back. 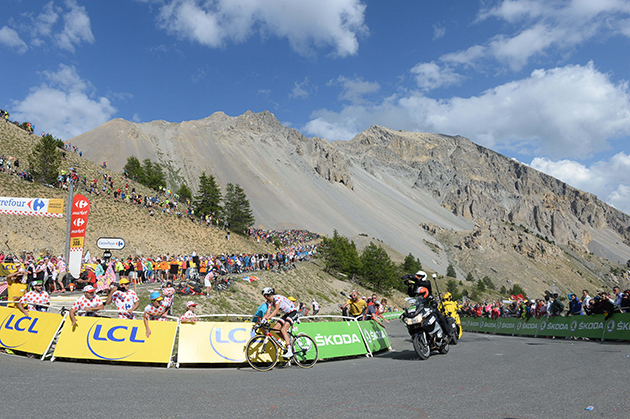 Though the Tour has gone over the Izoard 34 times, it has never been used for a hilltop stage finish. This 35th trip up the mountain will be a first. 16 km to go: Nicolas Edet and Alexey Lutsenko are in the lead. Eight riders are a half-minute back and the peloton is 4min 20sec behind the leading duo. 14 km to go: At the official start of the Izoard ascent Alexey Lutsenko has gone clear. The peloton is 4min 13sec behind with 37 riders between. 12 km to go: Four Ag2r riders lead the peloton with Froome's Sky team riding right behind. Lutsenko is 50sec ahead of a 6-man chase group. Now the peloton is 3min 53sec behind Lutsenko. 9 km to go: Lutsenko is 46sec ahead of Gallopin, Navarro and Atapuma. The peloton keeps getting closer (and smaller) and is now 3min 18sec behind Lutsenko. Darwin Atapuma has gone clear and is chasing Lutsenko. 6 km to go: Atapuma is only 10 seconds behind Lutsenko. Ag2r is hammering away at the front of the peloton. Sky has taken over leading the peloton. Barguil has taken off from the peloton with Contador chasing. 5 km to go: The Sky-led group is just 1min 45sec behind Atapuma. Now Dan Martin accelerates and Sky is right on him. 4 km to go: Atapuma is only 1min 19sec ahead of the Froome group. Mikel Landa (Sky) takes off. Sky is surely trying to put two men on the podium. 3 km to go: The long-awaited attack from Romain Bardet finally happened. Froome closes up to him with Uran on his wheel. Bam! Froome attacks and no one can respond. But Uran goes deep and brings Bardet with him up to Froome. Landa is caught by the Froome trio. 1 km to go: Barguil & Atapuma are 25sec ahead of the Froome group. And now Barguil has dropped Atapuma. The finish: Warren Barguil gets a clean win at the top of the Izoard in polka-dots. Atapuma follows in at 20 seconds. 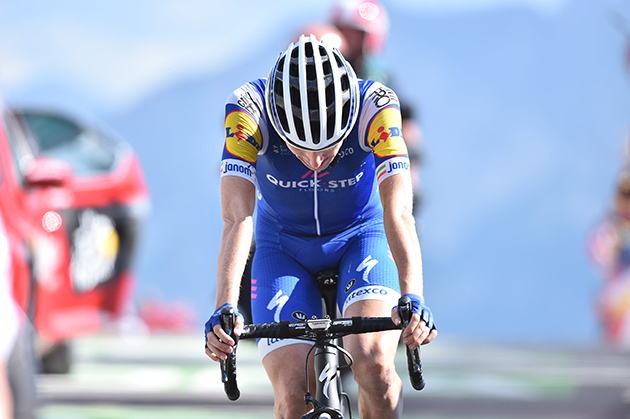 Warren Barguil claimed his second stage victory and the fifth for French riders at col d'Izoard (2360m) after passing Darwin Atapuma on Colombia's national day. 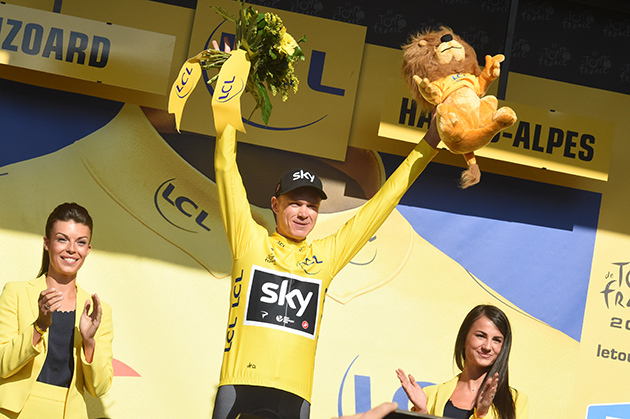 Chris Froome retained the yellow jersey albeit losing four seconds onto Romain Bardet who is again the runner up. 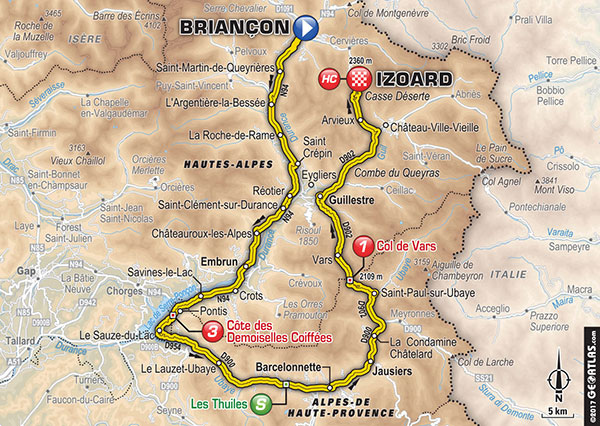 169 riders started stage 18 in Briançon. Thomas De Gendt (Lotto-Soudal), Alessandro De Marchi (BMC), Lilian Calmejane (Direct Energie) and Elie Gesbert (Fortuneo-Oscaro) rode away after 5km of racing. They were rejoined nine kilometers further by 50 other to make it a group of 54: Jan Bakelants and Cyril Gautier (AG2R-La Mondiale), Carlos Betancur and Jesus Herrada (Movistar), Bauke Mollema (Trek-Segafredo), De Marchi, Amaël Moinard and Nicolas Roche (BMC), Andrei Grivko, Bakhtiar Kozhatayev, Alexei Lutsenko and Michael Valgren (Astana), Darwin Atapuma, Kristjian Durasek, Marco Marcato, Ben Swift and Diego Ulissi (UAE Team Emirates), Rudy Molard (FDJ), Daryl Impey (Orica), Stephen Cummings, Serge Pauwels and Jaco Venter (Dimension Data), Gianluca Brambilla and Zdenek Stybar (Quick-Step Floors), Robert Kiserlovski, Maurits Lammertink, Tiago Machado and Nils Politt (Katusha-Alpecin), Tiejs Benoot, De Gendt, Tony Gallopin and Jurgen Roelandts (Lotto-Soudal), Simon Geschke (Sunweb), Dimitri Claeys, Nicolas Edet and Dani Navarro (Cofidis), Thomas Voeckler, Calmejane, Sylvain Chavanel, Romain Sicard and Angelo Tulik (Direct Energie), Pierre Rolland, Simon Clarke and Andrew Talansky (Cannondale-Drapac), Sonny Colbrelli and Tsgabu Grmay (Bahrain-Merida), Guillaume Martin, Marco Minnaard and Dion Smith (Wanty-Groupe Gobert), Brice Feillu, Gesbert, Romain Hardy, Eduardo Sepulveda and Florian Vachon (Fortuneo-Oscaro). After the côte des Demoiselles Coiffées (km 60) that gave De Gendt the occasion to score two more KOM points, seven riders rode away: Swift, Pauwels, Brambilla, Clarke, Vachon, Chavanel and Tulik. They were reeled in before the intermediate sprint won by Colbrelli at km 91 where a maximum time difference was recorded: 8.15. Bora-Hansgrohe took over from Team Sky in the lead of the peloton and it was the turn of AG2R-La Mondiale to bring the deficit down to 6.15 atop the col de Vars where Lutsenko, Atapuma and Sicard composed a leading quartet. They were reinforced with 28km to go by Edet, Navarro, Grmay and Hardy, and later by Molard and Ulissi. Lutsenko and Edet forged on with 20km to go while AG2R-La Mondiale was pulling the bunch with a deficit of 4.50. Lutsenko rode away solo with 15km as the ascent to col d'Izoard was starting. 6.5km before the summit, Atapuma passed Lutsenko while Warren Barguil (Sunweb) and Alberto Contador (Trek-Segafredo) attacked from the yellow jersey group. Barguil continued chasing on his own. 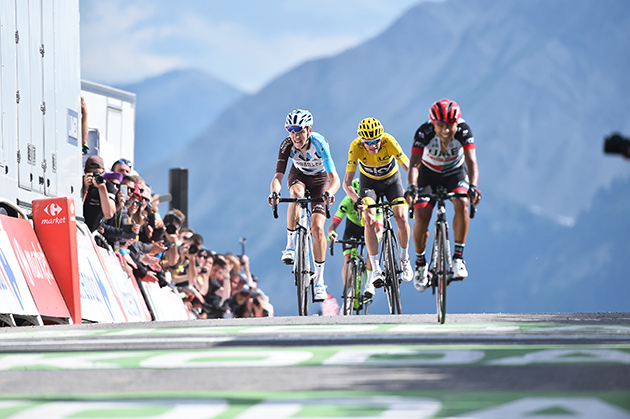 1.5km to go, Barguil caught Atapuma and rode him off to take his revenge from the 2016 Tour de Suisse when he finished second to the Colombian in a stage. 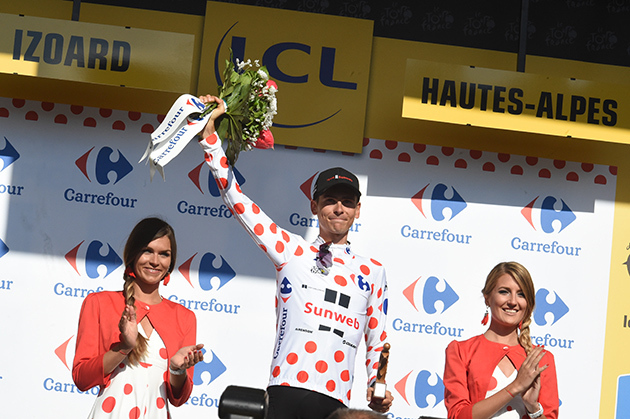 Barguil soloed to the most beautiful victory of his career at the col d'Izoard, wearing the polka dot jersey that he already mathematically secured at col de Vars. Fighting for the yellow jersey, Romain Bardet attacked under the 3km to go banner. 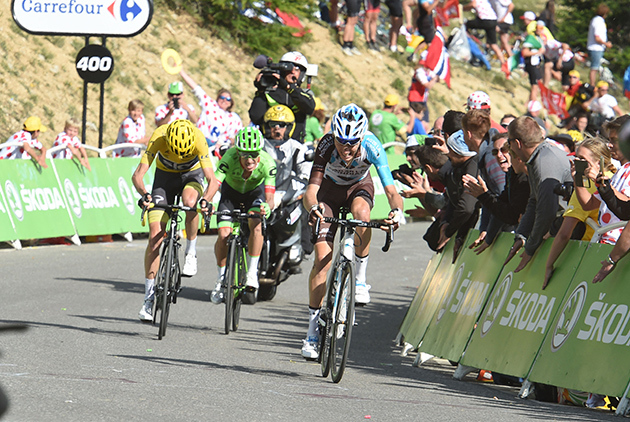 Chris Froome countered him but they were reunited with Rigoberto Uran and Mikel Landa to sprint to third place behind Barguil and Atapuma. 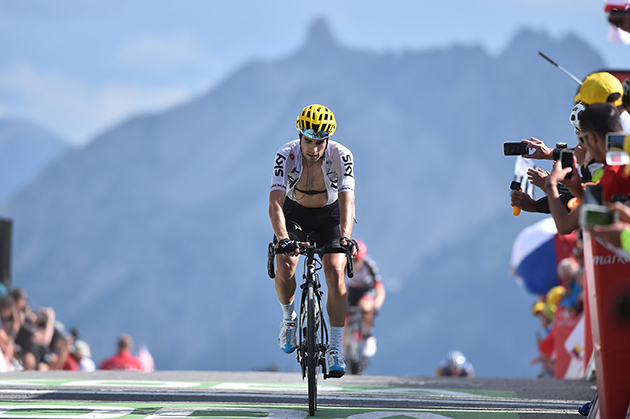 With the time bonus, Bardet returned to second place overall, 23 seconds down on Froome and six seconds ahead of Uran while Fabio Aru dropped to fifth with three stages to go including the individual time trial in Marseille on the penultimate day. 3 BARDET ROMAIN AG2R LA MONDIALE s.t. 19 MOLLEMA BAUKE TREK-SEGAFREDO s.t. 26 HARDY ROMAIN FORTUNEO-OSCARO s.t. 31 BUCHMANN EMANUEL BORA-HANSGROHE s.t. 36 IMPEY DARYL ORICA-SCOTT s.t. 37 KISERLOVSKI ROBERT KATUSHA-ALPECIN s.t. 38 FRANK MATHIAS AG2R LA MONDIALE s.t. 39 ROLLAND PIERRE CANNONDALE-DRAPAC s.t. 44 GRMAY TSGABU GEBREMARYAM BAHRAIN-MERIDA s.t. 49 VOECKLER THOMAS DIRECT ENERGIE s.t. 55 VALGREN ANDERSEN MICHAEL ASTANA s.t. 56 ZUBELDIA HAIMAR TREK-SEGAFREDO s.t. 62 KWIATKOWSKI MICHAL SKY s.t. 63 SCHÄR MICHAEL BMC s.t. 65 EDET NICOLAS COFIDIS s.t. 67 CLARKE SIMON CANNONDALE-DRAPAC s.t. 71 NAESEN OLIVER AG2R LA MONDIALE s.t. 72 PICHON LAURENT FORTUNEO-OSCARO s.t. 73 KEUKELEIRE JENS ORICA-SCOTT s.t. 74 DE KORT KOEN TREK-SEGAFREDO s.t. 75 SÜTTERLIN JASHA MOVISTAR s.t. 76 MACHADO TIAGO KATUSHA-ALPECIN s.t. 77 BAK LARS YTTING LOTTO SOUDAL s.t. 80 GESBERT ELIE FORTUNEO-OSCARO s.t. 81 BOUET MAXIME FORTUNEO-OSCARO s.t. 83 VAN AVERMAET GREG BMC s.t. 85 VACHON FLORIAN FORTUNEO-OSCARO s.t. 88 CHAVES JOHAN ESTEBAN ORICA-SCOTT s.t. 91 GRIVKO ANDRIY ASTANA s.t. 92 SMITH DION WANTY-GROUPE GOBERT s.t. 93 BAUER JACK QUICK-STEP FLOORS s.t. 94 SWIFT BEN UAE TEAM EMIRATES s.t. 95 CUMMINGS STEPHEN DIMENSION DATA s.t. 96 ERVITI IMANOL MOVISTAR s.t. 97 VAN KEIRSBULCK GUILLAUME WANTY-GROUPE GOBERT s.t. 100 QUEMENEUR PERRIG DIRECT ENERGIE s.t. 101 LATOUR PIERRE-ROGER AG2R LA MONDIALE s.t. 102 CALMEJANE LILIAN DIRECT ENERGIE s.t. 103 HERRADA JESÚS MOVISTAR s.t. 104 VAN BAARLE DYLAN CANNONDALE-DRAPAC s.t. 105 ARASHIRO YUKIYA BAHRAIN-MERIDA s.t. 107 POLITT NILS KATUSHA-ALPECIN s.t. 109 MORENO BAZAN JAVIER BAHRAIN-MERIDA s.t. 110 CINK ONDREJ BAHRAIN-MERIDA s.t. 114 ROGLIC PRIMOZ LOTTO NL-JUMBO s.t. 117 SINKELDAM RAMON TEAM SUNWEB s.t. 118 MATTHEWS MICHAEL TEAM SUNWEB s.t. 119 VERMOTE JULIEN QUICK-STEP FLOORS s.t. 120 SABATINI FABIO QUICK-STEP FLOORS s.t. 121 OFFREDO YOANN WANTY-GROUPE GOBERT s.t. 122 MC CARTHY JAY BORA-HANSGROHE s.t. 123 ROWE LUKE SKY s.t. 124 THWAITES SCOTT DIMENSION DATA s.t. 125 CURVERS ROY TEAM SUNWEB s.t. 126 BOLE GREGA BAHRAIN-MERIDA s.t. 127 BACKAERT FREDERIK WANTY-GROUPE GOBERT s.t. 128 HANSEN ADAM LOTTO SOUDAL s.t. 129 HOLLENSTEIN RETO KATUSHA-ALPECIN s.t. 130 BEVIN PATRICK CANNONDALE-DRAPAC s.t. 131 LE GAC OLIVIER FDJ s.t. 132 WAGNER ROBERT LOTTO NL-JUMBO s.t. 133 PASQUALON ANDREA WANTY-GROUPE GOBERT s.t. 134 GREIPEL ANDRÉ LOTTO SOUDAL s.t. 135 JANSE VAN RENSBURG REINARDT DIMENSION DATA s.t. 136 SENECHAL FLORIAN COFIDIS s.t. 137 ALBASINI MICHAEL ORICA-SCOTT s.t. 138 BOASSON HAGEN EDVALD DIMENSION DATA s.t. 139 POLJANSKI PAWEL BORA-HANSGROHE s.t. 140 SELIG RÜDIGER BORA-HANSGROHE s.t. 141 BODNAR MACIEJ BORA-HANSGROHE s.t. 142 LAENGEN VEGARD STAKE UAE TEAM EMIRATES s.t. 143 GROENEWEGEN DYLAN LOTTO NL-JUMBO s.t. 144 CASTROVIEJO JONATHAN MOVISTAR s.t. 145 LEEZER TOM LOTTO NL-JUMBO s.t. 146 VENTER JACOBUS DIMENSION DATA s.t. 147 HAYMAN MATHEW ORICA-SCOTT s.t. 148 PHINNEY TAYLOR CANNONDALE-DRAPAC s.t. 149 BENNATI DANIELE MOVISTAR s.t. 150 TIMMER ALBERT TEAM SUNWEB s.t. 151 TEUNISSEN MIKE TEAM SUNWEB s.t. 152 ARNDT NIKIAS TEAM SUNWEB s.t. 153 ZABEL RICK KATUSHA-ALPECIN s.t. 158 EISEL BERNHARD DIMENSION DATA s.t. 159 DEGENKOLB JOHN TREK-SEGAFREDO s.t. 160 HALLER MARCO KATUSHA-ALPECIN s.t. 161 GOGL MICHAEL TREK-SEGAFREDO s.t. 162 KRISTOFF ALEXANDER KATUSHA-ALPECIN s.t. 163 PETIT ADRIEN DIRECT ENERGIE s.t. 167 BOUHANNI NACER COFIDIS s.t. 168 LEMOINE CYRIL COFIDIS s.t. A stunning backdrop for the final mountain stage. The caravan preceedes the riders. Warren Barguil is alone and away. Romain Bardet tried to get away, but he was reeled in. Darwin Atapuma leads Romain Bardet & Chris Froome over the line. Dan Martin didn't leave anything on the table after this stage. He finished 8th today. 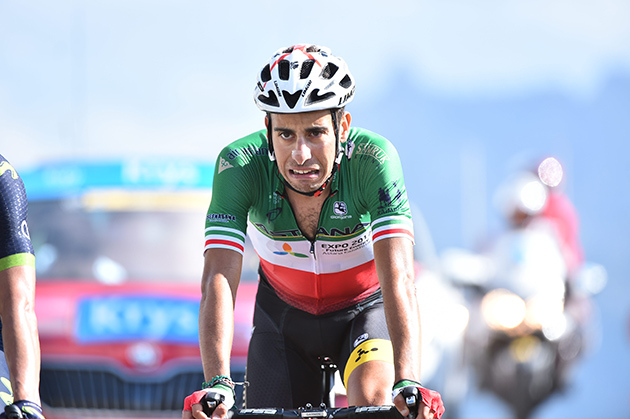 Fabio Aru doesn't look to have enjoyed his day in the Alps. Warren Barguil has won the King of the Mountains classification if he finishes the Tour. 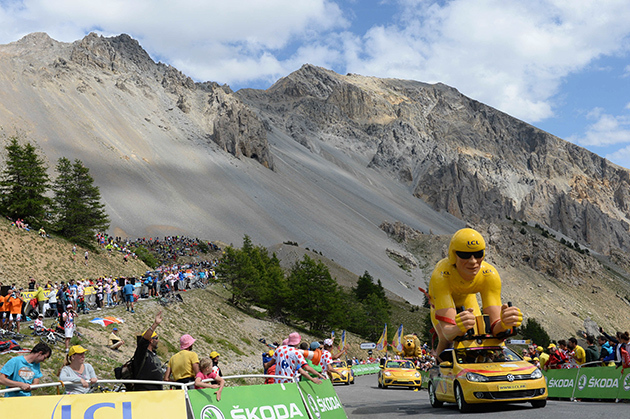 After the high mountains Chris Froome is still in yellow. 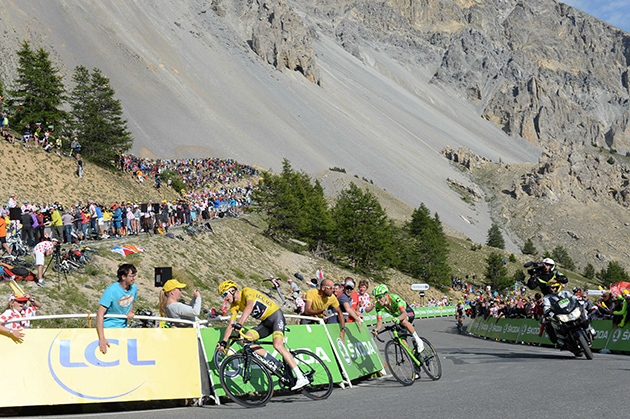 In recent years, col d'Aubisque (2007), col du Tourmalet (2010) and col du Galibier (2011) have hosted extraordinary stage finishes whereas the Tour de France usually crests those summits and proceed to another destination. It's a mission to logistically organize stage finishes atop those legendary climbs. They aren't ski resorts but natural beauties. This year, it's the turn of the Izoard as the Grande Boucle celebrates the 40th anniversary of Bernard Thévenet's second victory. In everyone's mind, the Frenchman's first overall win in 1975 was more touching because the day after he dethroned Eddy Merckx in Pra-Loup, he received the visit of the first French three times winner of the Tour. Louison Bobet instructed him to enter the Casse Déserte alone and pass the Izoard first. It was something a Maillot Jaune HAD to do. Thévenet did it. Bobet was three times first at the Izoard and Fausto Coppi twice [in the Tour de France]. On 22 July 1953, instead of defending his title, Coppi was on the road side to take a photograph of Bobet alone in the lead. Two kilometers before the top, in the most arid part of the grueling climb, Coppi and Bobet share a stele. If Chris Froome cares about the legend, he'll do his best to win with the yellow jersey in a solo effort atop the Izoard. 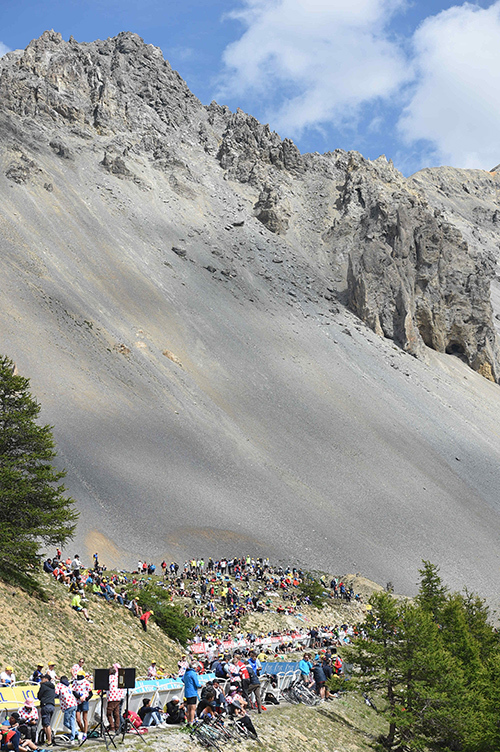 It'll be his first time racing on this climb as it was the case at the Galibier on stage 17. He's got the team to help him achieve the maximum result but Rigoberto Uran and Romain Bardet who are only 27 seconds down on him on GC probably have other ideas. The grand finale in the mountains this year is an unprecedented one.